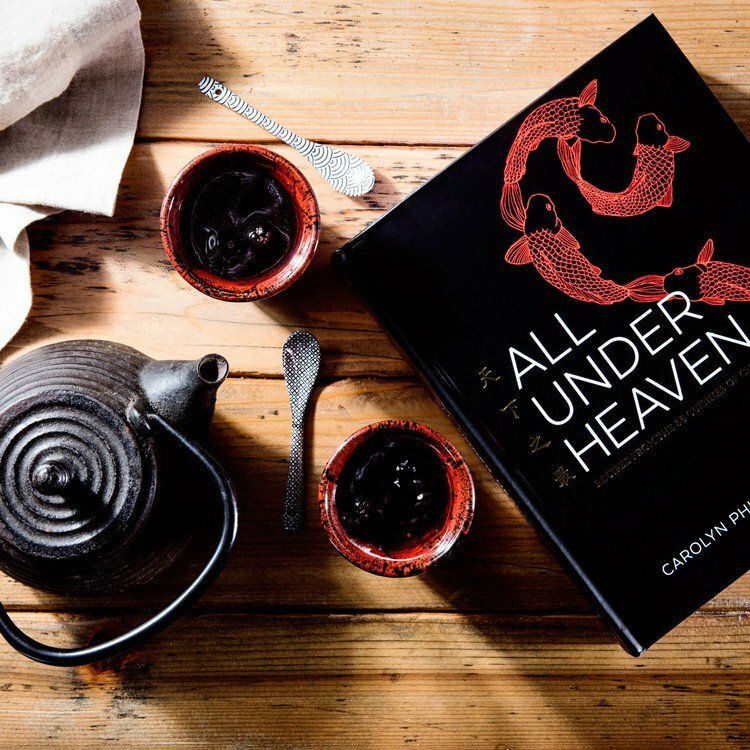 Please check out the insanely wonderful review of All Under Heaven that Paula Forbes wrote for Epicurious. I'm still in a state of shock. 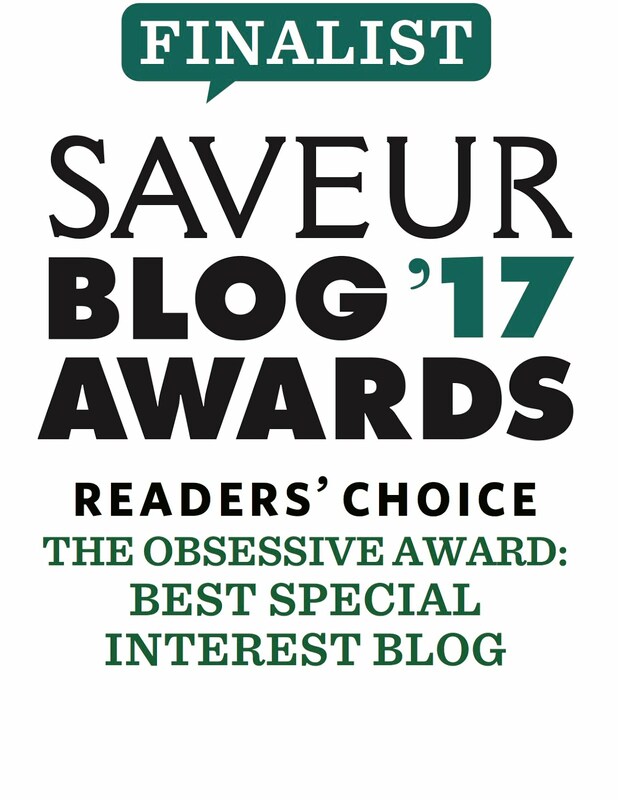 Dianne Jacob posted a lovely interview with moi for her blog, and I'm so delighted with the nice things she has to say. If you want to write a cookbook, please do read her books and blog - they're the best! Also, Susan Gordon on Signature Reads gave All Under Heaven a big thumbs up. Thank you again, Susan, for being so kind. And a reminder: I'll be speaking at the 92nd Street Y and the Smithsonian this week. Hope to see you there! Some folks say this dish comes from Guangzhou, while others insist it’s a Chinese American invention. I really don't know and, to be honest, don’t really care all that much because it is so absolutely delicious and wonderful and easy. I kind of hesitate to confidently declare this a Chinese American classic because I used to eat it all the time in Taipei back when I was a student. Of course, it could very well be that someone might have brought a similar recipe back from the States. Stranger things have certainly happened in the annals of culinary history. 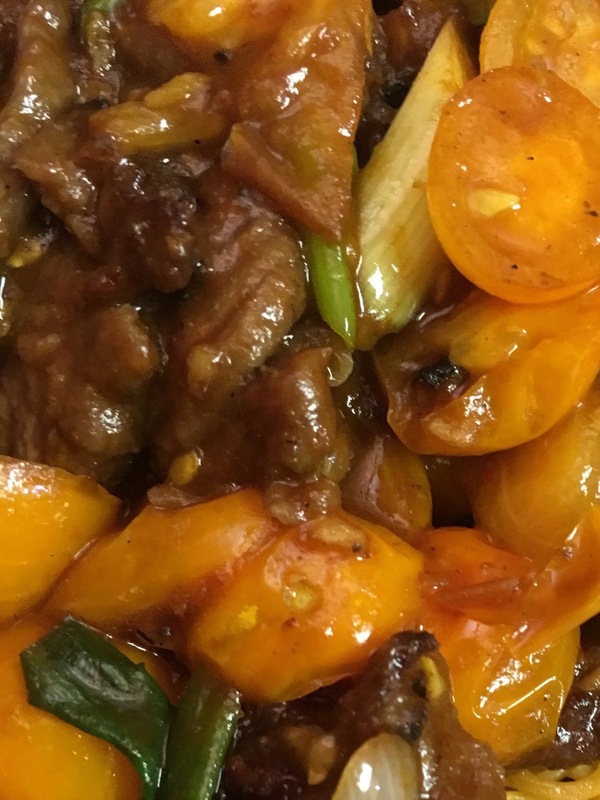 But the Cantonese have a delicious way of pairing beef with tomatoes, usually with a light sweet-and-sour sauce that somehow fuses them together perfectly, along with the usual aromatic fireworks caused by fresh ginger, garlic, and green onions. So, like I say, who knows. Over the years, I’ve come to make this many ways, but the recipe below is without a doubt my own favorite take. It’s a dish that I tend to reserve for late summer and early autumn, the time when tomatoes can’t get any better. Plus, the weather is still warm enough that a good plate of noodles will satisfy me completely. These noodles are amazing, by the way. You can find Cantonese egg noodles in most Chinese grocery stores, where they will be perched in a refrigerated case alongside other pastas and chilled breads. Look for thin, light yellow strands – the thinner the better, because then they will fry up into crispy little shards that shatter with each bite. When you find a package that looks about right, check out the ingredients: there shouldn’t be much more in there than flour and eggs. Avoid noodles that are bright yellow, since that’s usually the mark of food coloring. More and more American-based manufacturers are getting into the noodle-making game, so try to find one that’s made here, as the quality will be better and they will probably be a whole lot fresher. Keep them refrigerated, and use them up as soon as you can, especially if you open up the package. The one thing that makes this recipe different from most others is that I like to cut the crispy noodle pillow into wedges. 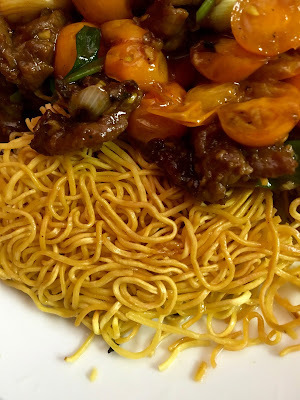 If you’ve ever wrestled with this dish in restaurants, you’ll know what I’m trying to avoid, since you want the noodles nice and crispy, but they won’t surrender until they’ve softened in the sauce a bit. I have avoided this problem by whacking them up before the sauce gets poured on top. If you are serving more than two people, double all of the ingredients. However, if you double the recipe, fry two pillows; if you triple it, make three pillows; and so on. The reason for this is, if you make too large a pillow, it won’t heat through before the bottom burns, so keep this in mind. 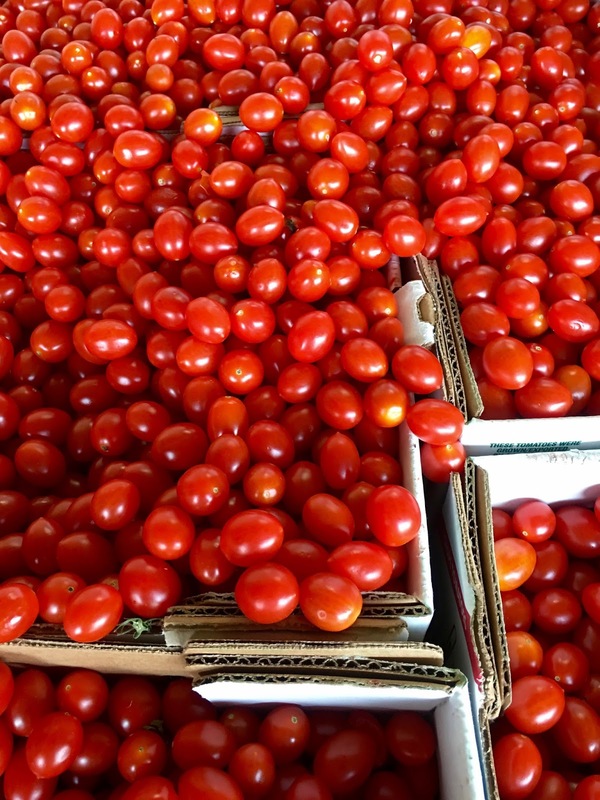 Now, let’s talk about catsup. I’ve come to like Sir Kensington’s spiced, which has a great balance of flavors and just a hit of chile, but go with what you like. Taste the sauce after you mix it up and then adjust the levels with whatever seems right. 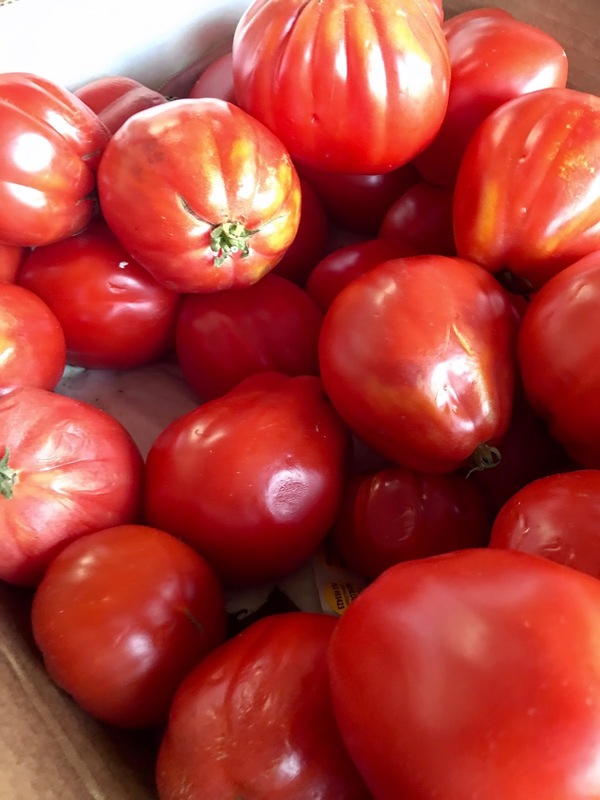 The tomatoes will also play a big part in the final flavor spectrum, with sweet ones demanding less sugar, while tarter ones, of course, requiring a touch more. It’s all up to you and what tastes right. This is a perfect meal in itself. 1. Slice the beef against the grain into thin pieces; the size really doesn’t matter, just make them bite-sized and more or less evenly shaped. Toss the beef in a small work bowl with the rice wine, soy sauce, cornstarch, and baking soda. Allow the beef to marinate while you prepare the rest of the ingredients. 2. Bring the water to a boil and add the salt. Shake the noodles into the water and stir them for 20 to 30 seconds (or according to package directions), which will slightly rehydrate them, but you don’t really want them cooked at this point. Pour the water and noodles into a colander set in the sink and immediately run cool water over the noodles, tossing them around so that they stop cooking. Drain in the sink, tossing them now and again when you think of it. Sprinkle on the sesame oil and toss them with this so that they don’t stick together. 3. 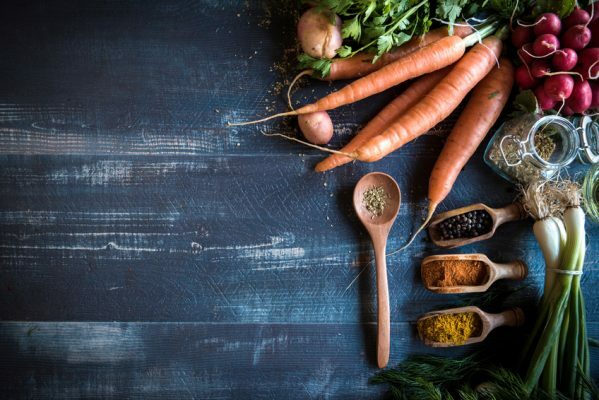 Mix the sauce ingredients in a small measuring cup; taste and add a bit of rice vinegar, if you think it needs it, but it all depends upon the catsup and Worcestershire sauce. Rinse the tomatoes and cut larger ones into wedges or slice cherry/plum tomatoes in half – again, they should be bite-sized and attractive. Have the other aromatics ready to go in little piles. This recipe can be prepared up to this point and everything refrigerated for up to a day. 4. First fry the noodles. Set a wok over medium heat and add the oil. When the oil starts to shimmer, pile the noodles in the center of the wok. 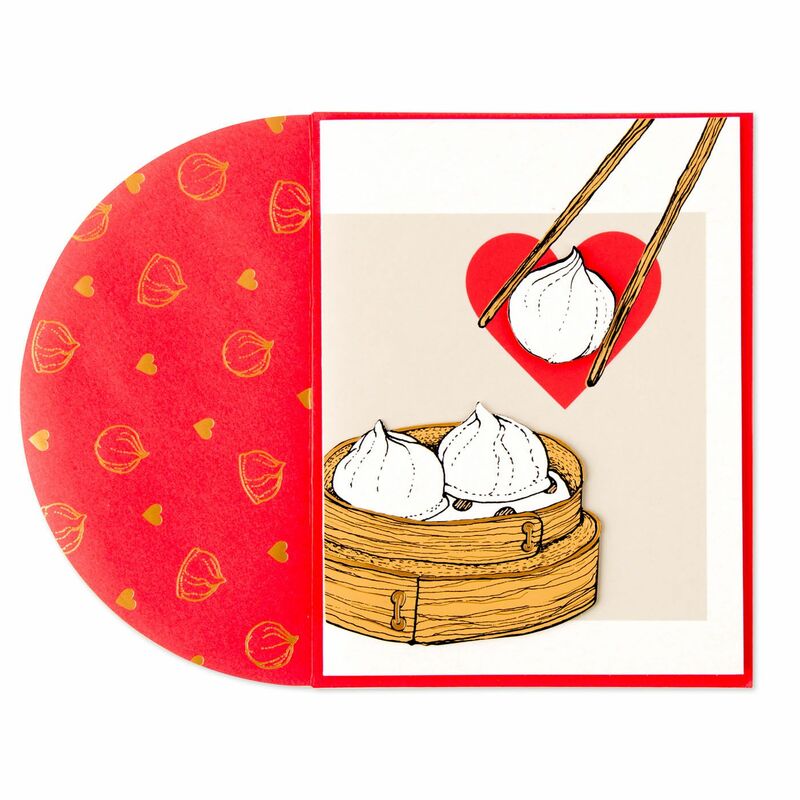 Use a wok spatula to corral them into a neat pillow, and then lightly pat the noodles down so that they wind around each other into a firm nest. Fry the noodles and shake the wok a little bit now and then while keeping an eye on them until they are golden on the bottom, which will take around 5 to 10 minutes, depending upon your stove. Flip them over and fry until the second side is also golden, and then slide them out onto a plate. Drain any oil on the plate and all but around ¼ cup / 60 ml of the oil in the wok into a heatproof bowl. Use kitchen shears to cut the crispy noodles into wedges, if you like. 5. Raise the heat under the wok to high. Toss the ginger and garlic in the hot oil for a few seconds, and then add all of the beef. 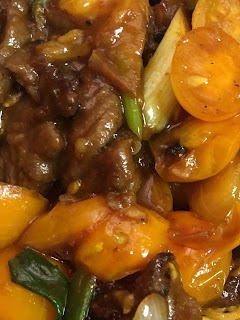 Break apart any lumps and toss the meat now and then so that it sears and caramelizes along the edges. Once that happens, toss in the tomatoes, green onions, and the sauce. Keep tossing until the tomatoes are hot, and then immediately scrape everything on top of the noodles. Serve and then revel in these early days of autumn. My copy arrived on Monday. So much to read and learn! Looking forward to your comments, Mike, and thanks! Amazon got my pre purchase to me here, in Australia last week! I enjoyed the Epicurious review, but totally disagree about the book needing photos. Well done drawings can be more illustrative than a photo, and yours show techniques very clearly. From reading Amazon reader reviews of various cookbooks I'm struck by the insistence on a photo per recipe as a minimum expectation. Yes, if plating is an essential part of a dish, then a photo can be useful, but unless the author is particularly inarticulate good descriptions really are enough in most cases. I think it is a lazy habit to flick through the photos before deciding whether to actually read a recipe when even a quick skim will usually tell you so much more. Congratulations on the book, it is everything I thought it would be, and more. I hope the photo obsessed will take the time to read it as it will repay them handsomely. I'm blown away by your comments, Polly. Thank you so very, very much! I also appreciate you finding a way to purchase this in Australia. Truly honored by that. I hope the book lives up to your expectations and more! 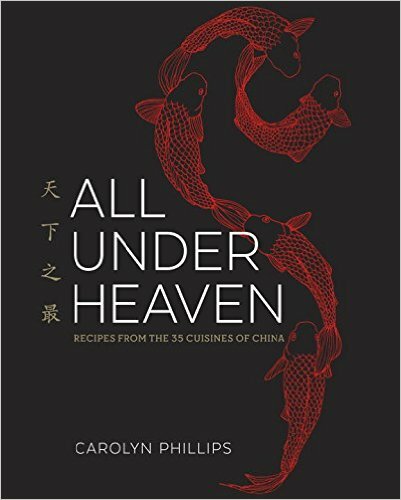 Carolyn, I enjoy reading all the contextual information you give with each recipe here, on the site but having all the strands woven together, region by region is great. 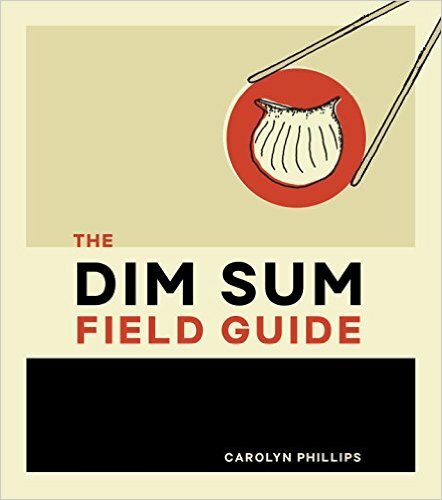 The book has already given me a couple of, "aha" moments when you explain the connections between dishes in different regions, or how and why some dishes developed and evolved. Thank you for this terrific resource! When are the James Beard book nominations announced? Oh man, now you have my head spinning. What a delightful thing to say! If you have any pull with the JBF folks... Anyway, wow, thank you so much for making my week!